NEW YORK (CelebrityAccess MediaWire) — Make Music Day announced a lineup of more than 2,250 free, outdoor musical events taking place in 23 U.S. cities including New York, Los Angeles, Chicago, Boston, Nashville, San Diego, Seattle, Madison and Philadelphia. The world's largest annual music event will fill June 21, the first day of summer, with sound. Make Music Day is free to the public and everyone is invited to play along. Make Music started in France in 1982 as Fete de la Musique, also known as World Music Day, and has grown to over 700 cities across 120 countries. The all-day musical celebration will feature countless music making opportunities and performances in every musical style, ranging from classical to folk, hip hop to opera, and Latin jazz to punk rock. Over 100 Mass Appeals taking place in 31 U.S. communities will bring together musicians – of all levels and ages – to make music in large, single-instrument groups. These Mass Appeal gatherings are an opportunity for players to meet up with others and jam. Instruments with mass appeal include cellos, guitars, harmonicas, accordions, banjos, mariachi, percussion, trombones, saxophones, mariachis, French horns, flutes, synthesizers, ukuleles, Klezmer violins and more. Those who've always wanted to play music can start on Make Music Day thanks to free guitar, harmonica, ukulele, drum and other instrument lessons being offered nationwide. Events in Los Angeles, New York City, Chicago, Nashville, Cleveland, San Diego, Fort Wayne and more, will open up the power of playing music to all. Those feeling the beat can tap into drum lessons in Los Angeles, Cleveland and Willimantic, CT. Students will have the opportunity to learn drumming basics and then play as a group. 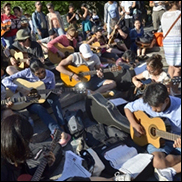 In New York City, guitar teachers will set up near Madison Square Park, equipped with a guitar for themselves and guitars for anyone interested in learning to play. Whether a person's chops are fresh off a free lesson or refined over decades, everyone is invited to the annual gathering of 400 guitar players in New York's Union Square. Clavinova Piano Bar: In celebration of the 100th birthday of Frank Sinatra, roving Sinatra karaoke piano bars will make designated stops in New York, Chicago and Seattle. Exquisite Corpses: In partnership with Jazz at Lincoln Center and NPR Music, New York City's burial grounds will come to life with improvised musical conversations. Sousapalooza: New York City, Chicago and Nashville will bring together hundreds of brass and wind musicians for the first time to play the music of John Philip Sousa. Les Paul's 100th Birthday Celebration: Boston will host concerts celebrating the 100th anniversary of the famed songwriter and inventor. Porch Stomp: Celebration of bluegrass, old-time, traditional folk and roots music, on the historic porches of Governors Island in NYC. Street Studios: Pop up recording studios will appear on sidewalks throughout New York City to engage the public in the spontaneous, collaborative production of original music. Make Music Instrument Works: In Portland, OR, Aaron Nigel Smith and Home Depot will host a fun day of making musical instruments using everyday household items. — Strats for Kats: In Fullerton, CA, Phyllis Fender, Lit, Big Bubba Blues Band, and others will jam to Louis, Louis and Smoke on the Water. — 60's Rock Stage: Madison, WI is inviting musicians of all skill levels to come play six of the all-time greats: Woolly Bully, Louie Louie, Johnny B Goode, Good Lovin', Wipe Out and Twist and Shout. — Mariachis: San Diego musicians, music lovers and anyone who wants to make music will gather and play this fun musical style. All Make Music Day events are free and open to the public. A full list of participating cities and events can be found atwww.makemusicday.org .